Fictional heroes often defy expectation and achieve their heart’s desire against all the odds, to resounding hurrahs. We all love an underdog, or an outsider, especially when she or he succeeds. Except when we don’t. In the political arena this summer we have seen the ‘outsiders’ triumph, to massive acclaim from their supporters and huge dismay from their opponents. 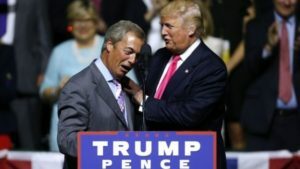 That Farage, the UKIPers and, in the US, Donald Trump, are outside what is usually regarded as the political class is widely recognised as one of the major reasons why they have been victorious. Their voices are thought to be authentic in a way that professional politicians’ voices are not, almost regardless of what they are saying and, in Trump’s case at any rate, regardless of unpleasant personal proclivities. But are they underdogs? 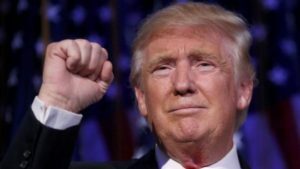 Trump is a multi-millionaire businessman and TV celebrity, Farage is a wealthy former City trader backed by a multi-millionaire, Johnson, Davies and Fox aren’t short of money and much of the UK printed media, who acted as Brexit cheerleaders, are owned by multimillionaires, resident abroad for tax purposes or preference. So, no, surely not. Yet these expert players and beneficiaries of ‘the system’ claim to be against it and, it is true, ‘the system’ has, in recent times and in whole or in part, set itself against them. At the UK General Election 4 million people voted for UKIP but this resulted in only one UKIP MP. In the US only one former Republican Presidential candidate has endorsed Trump. Such is the odium attaching to the established political class which represents that system, and its, very real, failings, that these outsiders’ claims carry weight. People aren’t stupid. They can be misled, that’s for certain, but voters, by and large, aren’t daft. I believed, and still believe, to an extent, that the Brexit vote was a vote informed by emotion rather than, or as much as, rationality, a ‘howl of protest’ at the ballot box. That is also in step with the wider tenor of the times, when opinion and feeling seem to matter more than evidence and fact. But there are good reasons why the economically ‘left behind’ and what Guy Standingˆ calls the ‘precariat’, those in low pay non-unionised ‘contract’ jobs or on zero hours contracts, no longer trust politicians and ‘the system’.° There are culturally ‘left behind’ too – and that doesn’t mean that these folk are necessarily racist or sexist (though some will be) it could just mean that they aren’t comfortable with change, they haven’t been persuaded of its rightness. The system itself – social and economic liberalism – as recently applied, has failed for a very large number of people. So why not gamble? 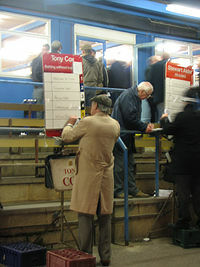 Take a punt on an outsider? When what is offered to you is a stronger and a weaker version of the same system which has failed you, go for something else (both Bernie Sanders and Jeremy Corbyn profited fro m this). Which brings me to those stalwart risk manipulators, the bookies. Their odds are usually not far out, but, like the professional pollsters, the bookmakers aren’t having a good time. They managed to get it wrong over the UK General Election, the Scottish Referendum and the Referendum on Britain’s membership of the EU. Trump was a 100-1 outsider until a year ago and was 9-2 on the night of the poll (compared to Clinton as favourite at 2-9). Ominously, the odds on Marine Le Pen being successful in the French national poll next Spring, are now 11-4, reducing from 6-1 before Tuesday’s result. Maybe the bookies have learned their lesson. Has everyone else? ° This may not apply in the same way, in the U.S. where Clinton won the majority of the popular vote and the majority of the votes from the poorest ‘working class’. Otherwise the split, in terms of age, education and location was the same as for Brexit ( though there was no voting pattern difference between genders in the UK whereas in the US Trump won more male votes, it’s still more difficult to get elected if you’re female ). The BBC web-site has a good comparison piece.